With the introduction of colour coded, and clearly labelled bins, waste is separated by building users: red bins are for general waste (including food); green bins are for mixed waste (plastic, tins etc. 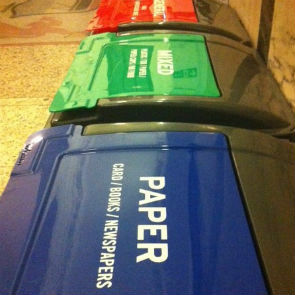 ), and the blue bins are for paper waste (does what it says on the bin). Since their introduction in 2013, we have been able to monitor our waste output and are very pleased with the results, as our landfill waste has decreased by 40%. We now also recycle glass, printer cartridges, and lightbulbs, and we will continue to inform and encourage our building users to reduce, reuse and recycle, wherever possible.